Would you giveaway alcoholic wedding favours at your wedding or pre-wedding celebration? This might be too risky a job to do, but what the heck! It’s your day, make it large. (Pun intended). Wedding favours: once a western concept is soon picking up on the Indian wedding stage. With couples struggling to find unique wedding favours to give as a memento to their guests, alcoholic wedding favours are not only unique in concept but will be well appreciated by receivers. Believe us when we say this! Although people may not say this out LOUD, everyone likes to take that one quick shot or two in the name of celebrations. In Indian wedding scenarios, giving away alcoholic wedding favours can offend the granpas and grannys. However, if Rishi Kapoor’s character in Kapoor & Sons is anything to go by, then NOT. To play a safer bet, and also because we do not want to get into any trouble, these giveaways are best for your bachelor/bachelorette parties, cocktail parties and after parties, if you intend to have one. If you’re a daring bridal couple, you have double thumbs up from us to go ahead and surprise your wedding reception guests with your unusual and wicked choice. Today, we share with you 10 trending ways of how you can giveaway these alcoholic wedding favours without breaking the bank. Explore. Cute Little Bows Can Make a Big Difference! 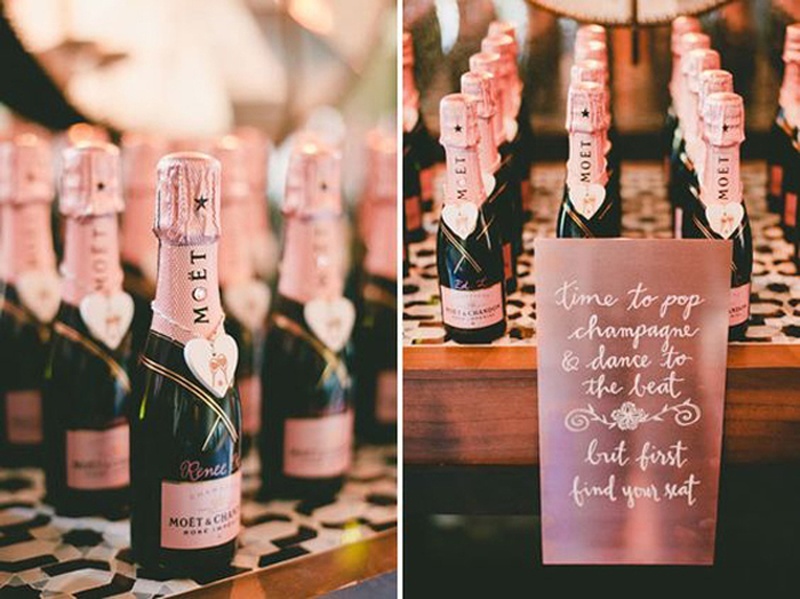 Dip The Bottle In Glitter To Fancy Things Up! Looking for more ideas to include alcohol in your wedding, check this and this one out!